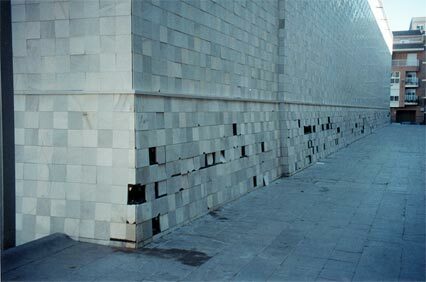 In February 2001, Joey Skaggs was invited by curator Jorge Luis Marzo to participate in an exhibition at the Espai D’Art Contemporani (EACC) in Castellon, Spain. The show, entitled “En el Lado de la Television” [In the Side of Television] was scheduled to run from October 4 to December 1, 2002. It was intended to explore the relationships, contradictions and paradoxes between art and the mass media. Skaggs proposed a concept dealing with terrorism, violence and the media that, even then, pre 9/11, was thought very controversial by the museum. After the attack on the World Trade Towers they were far more cautious. But they still wanted him involved. So in February 2002 they invited him to Spain to discuss the plans. During that visit, he convinced them to go ahead with his idea, though he adjusted it slightly to address a chronic problem the museum was having in the community. 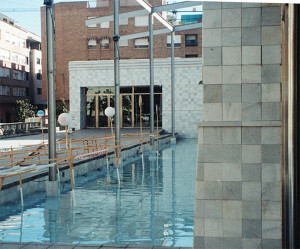 The museum, a little over three years old, was built with a marble facade. On one side was a wide walkway that separated the museum from another building. Many people walked through here to get from one street to another. In addition to pedestrians, there had been a rash of vandalism. People had been literally ripping the marble tiles from this wall. Vandals had also destroyed art installations displayed outside. The museum security guards were unable to do anything about it because they had no jurisdiction in the streets. By the time the police arrive, the vandals were gone. 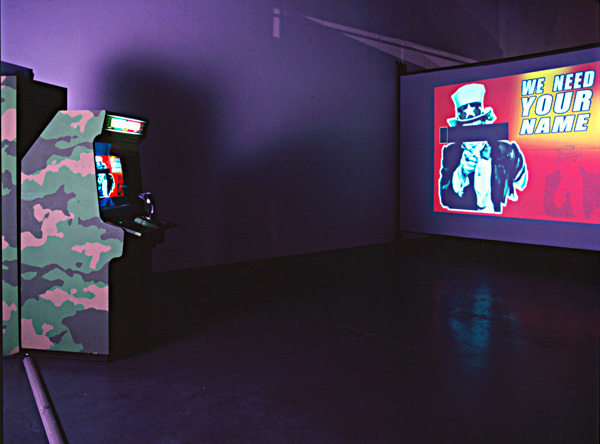 Skaggs’ installation consisted of a video arcade game inside the museum which was wired to a surveillance camera outside where the vandals do the damage. 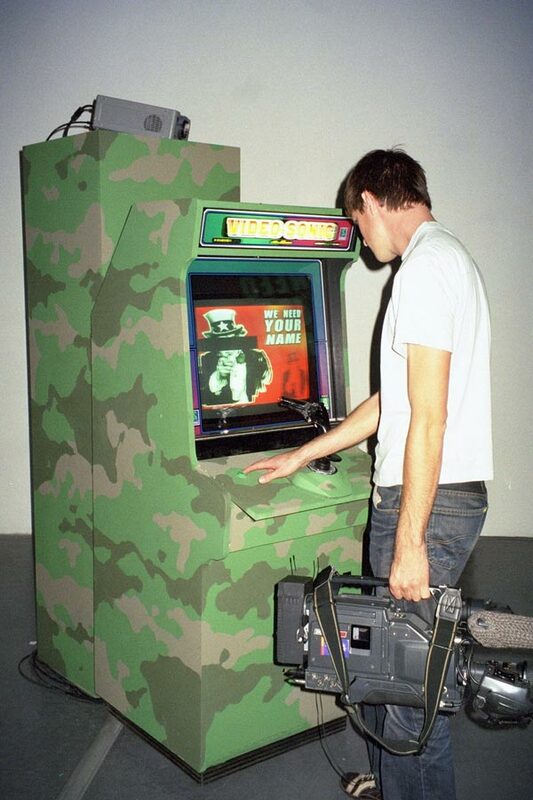 On the arcade game inside, there was an animated loop of soldiers shooting at the player and inviting the player to enter his or her name (to identify the high scorers) to begin the game. A joy stick control was a 45 caliber hand gun. The number of shots fired was a measure of the player’s level of aggression. 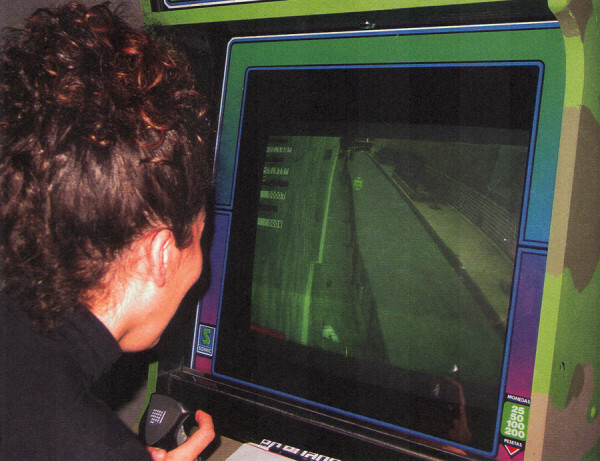 Once a name was entered, the player pushed the start button, the screen on the arcade game switched to the surveillance camera and the shooter saw live video of the outside walkway where they could shoot as people walked by. Visitors could participate, watch the shooter or watch the simultaneous projection of the surveillance video on a large screen. 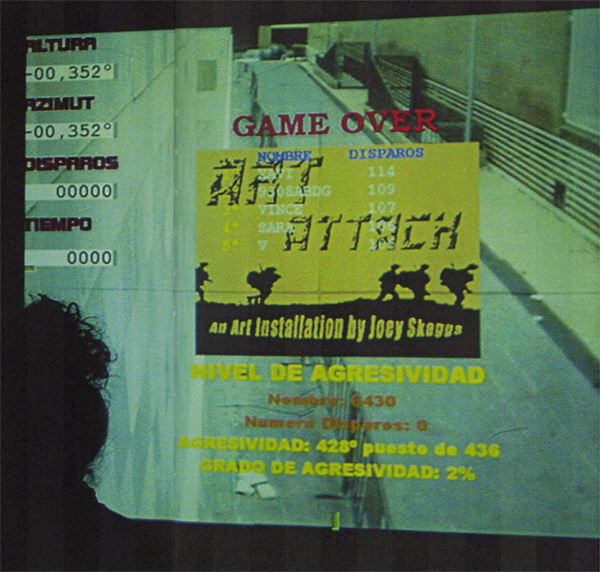 The shooter had 45 seconds to fire before the game ended and his or her aggression score appeared. The City Council contributed metal police barricades which were placed along the entire length of the museum, six feet from the wall. Skaggs drew silhouettes of dead bodies in white chalk on the ground by the barricades. While Skaggs was there, he observed groups of people coming in to shoot their friends outside. He watched the friends perform for the camera, falling down dead or wounded, and being dragged away by their comrades as others ran or ducked for cover. All this was documented by Spanish news crews and Swedish Public Television which came to Spain to do an interview with Skaggs that aired at the end of October in Sweden as the first in a new series about the media. 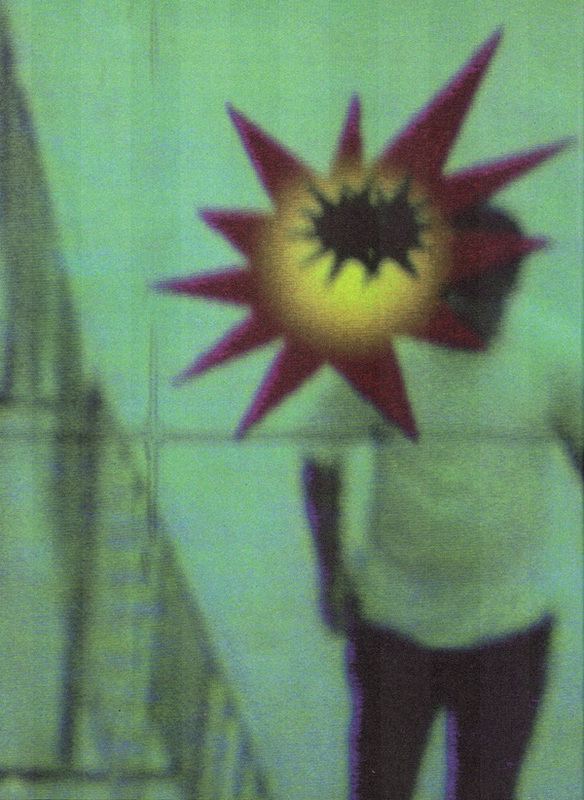 Given the scenario with the snipers randomly shooting people in the Washington DC area, which ironically was happening when the exhibition opened, the piece became even more disturbing. The effect of an unorthodox event sanctioned by a public institution and the response of the public and the media to it. The irony of ironies occurred a week after the opening. The “Art Attack” installation was vandalized. The gun was broken and someone dismantled and stole the projector connected to the surveillance camera, effectively “blinding” the eye onto the street. The theft was witnessed by a museum employee. He ran down from the second floor balcony, chased the perpetrator for blocks and retrieved the projector. However he was jumped by several of the vandal’s associates and attacked. 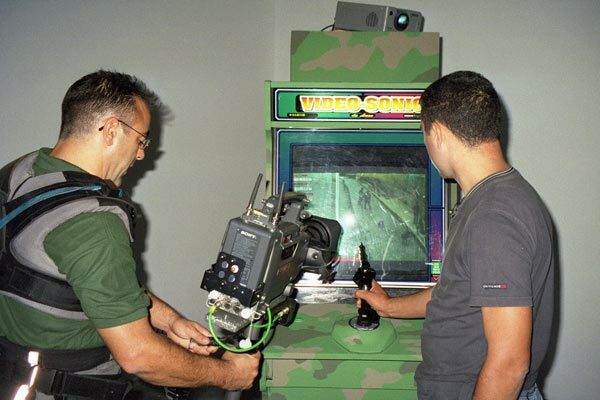 According to the Museum’s curator, he prevailed and triumphantly returned to the museum with the projector. Five days later, the piece was restored to working order.